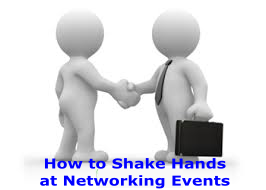 Greeting new and familiar people at business networking events traditionally includes shaking hands. A handshake, when performed properly, will communicate confidence and competence; however, a poor performance while shaking a hand leaves the recipient of the clasp feeling ill at ease. Knowing where to grab another’s hand, how hard to grip, and condition of one’s own hand are all helpful in successfully executing this key introductory gesture. Attendees at networking events should not only be prepared to shake hands at any time, they should be seeking to do so! The hand in question should be ready for action at a moment’s notice. Keep it clear: the right hand should not be holding a drink, hors d’oeuvre, or stack of brochures. Keep it clean: the shaking hand should likewise be free of moisture, grease, grime, and grit. Tip: networkers with sweaty palms can keep a cloth handkerchief in the pocket for use in keeping the hand dry. Clasp thumb to thumb. Make sure to slide the hand up until the skin at the joint of the thumb touches the same part of the other person’s hand. Gripping this far up will reduce the chances of a shake which is too firm. This is particularly important when a man is shaking the hand of a woman; taking just the fingers, as some men do, can lead to a painful squeeze of the lady’s hand. Grip firmly, but barely. The fingers should curl to clasp the other person’s hand, nothing more. Too strong a grip sends a message of aggression, not confidence. Use eye contact. Smile and repeat the person’s name aloud; if necessary double-check his or her name tag. Looking away suggests a lack of interest in the other person. Pump twice. This is enough to avoid being a “limp fish” handshaker, while not lasting overlong. One hand only. Each person should only use the primary hand for shaking – placing the left hand over the handshake or on the other person’s shoulder is overly familiar for networking introductions. Not everyone knows how to shake hands well, and even those that do may not have the tools to do it correctly. Being adaptable in this basic ritual can leave a lasting favorable impression. For example, a person with an injured or arthritic hand may offer fingers only or the left hand to shake; in these cases remember always to maintain eye contact and the proper number of pumps. If a handshake leaves one with the residue of grease or sweat on one’s hand, avoid any facial expressions that show distaste and may embarrass the shaking partner. Wipe the hand off discretely after the exchange to prepare for the next shake.